Preface. Multivariate environmental statistics in agriculture (V. Barnett). A study of the relationship between diversity indices of Benthic communities and heavy metal concentrations of northwest Atlantic sediments (N.C. Bolgiano, R.N. Reid, G.P. Patil). Multivariate non-normal statistics in site characterization and evaluation (J.H. Carson, Jr., A.K. Gupta). Spatial prediction in a multivariate setting (N. Cressie). Needs and developments in multivariate environmental monitoring statistics (G.T. Flatman). Certain multivariate considerations in ranked set sampling and composite sampling designs (S.D. Gore et al.). Relating two sets of variables in environmental studies (R.H. Green). Statistical analysis of biological monitoring data (P. Guttorp). Using entropy in the redesign of an environmental monitoring network (P. Guttorp et al.). Graphical techniques for enhancing the utility of multivariate environmental statistics (W.A. Huber). Carcinogenicity tests involving multiple tumor sites (R.L. Kodell, E.O. George). Errors-in-variables analysis of extrapolation procedures in environmental toxicology (E. Linder, G.P. Patil, G. Suter II). A unified linear model for estimation with composite sample data (G. Lovison). Change-point methods for spatial data (I.B. MacNeill, V.K. Jandkyala). A review of computer intensive multivariate methods in ecology (B.F.J. Manly). Spatial-temporal statistical analysis of multivariate environmental monitoring data (K.V. Mardia, C.R. Goodall). Correspondence analysis applied to environmental data sets (D.E. Myers). A meta-network approach to higher-order spatial constructs and scale effects (W.L. Myers). Estimation of trend in Chesapeake Bay water quality data (N.K. Nagaraj, S.L. Brunenmeister). The complexities and scenarios of ecosystem analysis (L. Orlóci). Multivariate methods in nuclear waste remediation. Needs and applications (B.A. Pulsipher). Omnibus robust procedures for assessment of multivariate normality and detection of multivariate outliers (A. Singh). Multivariate assessment of trend in environmental variables (E.P. Smith, S. Rheem, G.I. Holtzman). Multivariate chemometrics - a case study. Applying and developing receptor models for the 1990 El Paso winter PM10 receptor modeling scoping study (C.H. Spiegelman, S. Dattner). Weighted averaging partial least squares regression (WA-PLS): Definition and comparison with other methods for species-environment calibration (C.J.F. Ter Braak et al.). Multivariate aspects of adaptive cluster sampling (S.K. Thompson). Approximating multivariate distributions in stochastic models of insect population dynamics (T.E. Wehrly, J.H. Matis, G.W. Otis). 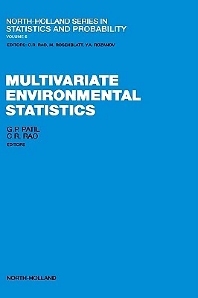 The main purpose of this volume is to provide a new perception of multivariate environmental statistics using some examples that are of concern and interest today. The papers are presented by outstanding research workers. They discuss the current state of the art in different areas of multivariate environmental statistics and provide new problems for future research and instruction. A perspective is to cover a broad spectrum of methods and issues involving multivariate observations and processes, and not just classical multivariate analysis. The book will be valuable to current statistical theory and practice in this area, and will be used by researchers, teachers, and students alike.